Images that could be hanging on your wall. Large Butte dominates the scene. There are great colors to be seen with artistic value. These rock formations in Arches Park show various layers of time. Arches Park brings many visitors and the size of the rock formations makes the camper seem small by comparison. 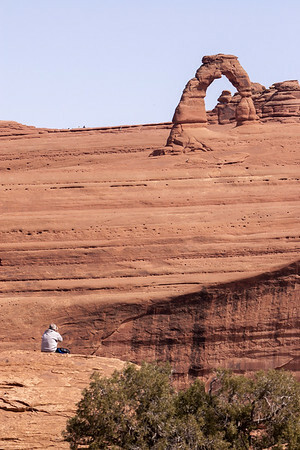 A lone photographer is looking toward Delicate Arch. A view to Delicate Arch from across the valley in Arches Park. The early morning light is slowly showing he beauty of Arches Park. The person is dwarfed by the size of the Arches Park Double Arch. Double Arch shows the amazing work of nature. These cactus in Arches Park have extremely long thorns. New life continues as the old tree slowly passes on. Grasses out of the sand in Arches Park. There are many forms of earth art in Arches National Park. Arches Park has walls of stone as well as the arches. 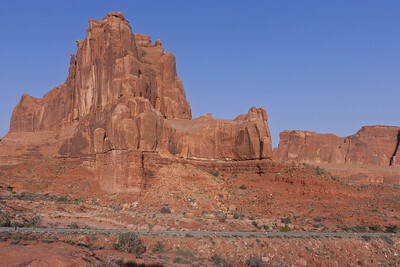 These large buttes greet you near the entrance of Arches Park. Wonderful colorful red stone of Arches National Park. This large Butte stands out. This enormous butte greets you near the entrance of Arches National Park.